Nalbufine Hydrochlorate is a synthetic phenanthrene, chemically related to Naloxone (narcotic antagonist) and to Oximorfone (morphinic agonist analgesic). NALBUFINE 10 is used as a narcotic analgesic to handle visceral and/or somatic pain. It is used to promote the sedative effect of mayor (Phenothiazines) and minor tranquilizers (Benzodiazepines). It could be combined with AINES analgesics (non steroid anti-inflammatories). It could be used jointly with anesthesic or hypnotic agents (Propofol, Sodium Thiopental, Ketamine, and Halothane). NALBUFINE 10 is an opiate analgesic as powerful as morphine (1/1), it has a agonist/antagonist. Its action begins quickly and its half-life is longer when it is applied subcutaneously. Nalbufine has a strong agonist effect over the Kappa receptors and a strong antagonist effect over the Mu receptors. Its agonist effect over Sigma receptors is minimal. It has no effects over the Delta and Epsilon receptors. Canines: 0.5 a 2 mg/kg SC, IM, IV. 1-2 mg/kg IM, IV of Nalbufine, equivalent to 0,1 - 0,2 ml/kg. 0,05-0.2 mg/kg IM of Acepromazine. 1-2 mg/kg IM, IV of Nalbufine, equivalent to 0,1-0,2 ml/kg. 0,5-1 mg/kg IM of Flunixin Meglumine. 0,4-2 mg/kg IM, IV of Nalbufine, equivalent to 0,04-0,2 ml/kg. 0,3 mg/kg IV of Nalbufine, equivalent to 0,03 ml/kg. This combination induces sedation, moderate ataxia and landing on head. Combination with NALBUFINE 10 does not modify the cardiovascular effects produced by Romifidine. When Romifidine is combined with meperidine, heart beat increases and blood pressure is reduced. • Nalbufine could interfere with the pro-kinetic action of the metoclopramide. • If it is use simultaneously with hydroxizine, CNS analgesics and depressors effects could be empowered. • When it is used with anesthesic or hypnotic, the doses of the last mentioned should be reduced. 20 ml vial of sterile injectable solution. 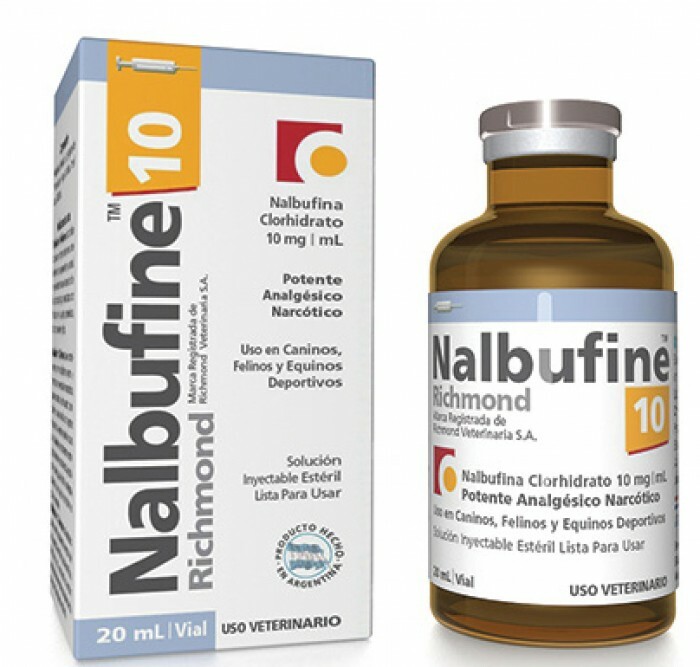 • General: NALBUFINE 10 is indicated to control slight to moderate pain. • As a part of a pre-anesthesic medication: NALBUFINE 10 could be combined with mayor and minor tranquilizers and analgesics used in pre-anesthesic medication, to strengthen its sedative effect. Doses of mayor tranquilizers (Acepromazine) could be reduced until a 70% depending on the case (particularly, in great bearing dogs and/or weak dogs). In sport equines it could be combined with Romifidine without modifying the cardiovascular effects that Romifidine produces. • Intra-surgical: NALBUFINE 10 is indicated when –because of any reason- it is required to strengthen the analgesia during a surgical procedure going into anesthesic level. (It is suggested to the professional in charge to pay attention to the respiratory system monitoring during the next 10 minutes after applying Nalbufine in search of respiratory depression). • Minor Surgery: NALBUFINE 10 could be combined with a hypnotic agent (Midazolam, Propofol, Thiopental) or a dissociative anesthesic (Ketamine) to make minor surgical proceedings or invasive diagnostics proceedings. These protocols could be complemented with local anesthesic (Bupivacaine, Lidocaine). These is to be considered by the Veterinarian in charge. • Post-surgical analgesia: Nalbufine Hydrochlorate is indicated to control post-surgical pain of somatic and/or visceral origin. • Traumatized and critical patients: NALBUFINE 10 could be used in patients under shock (of any origin and kind), in patients with cardiac insufficiency of valvular and/or myocardial origin. Patients with Gastric dilatation-volvulus (GDV) show a remarkable improvement when NALBUFINE 10 is supplied. NALBUFINE 10 is indicated in traumatized patients with isolated or multiple bone fractures and/or luxations. 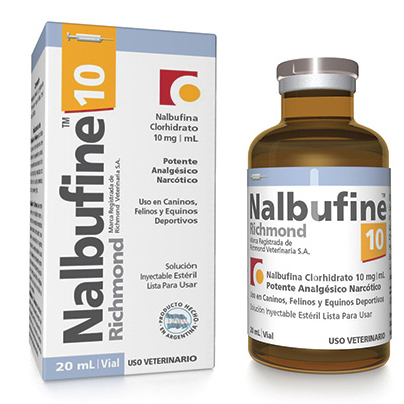 NALBUFINE 10 is very useful to control pain caused by burns of any kind and degree. In patients with drowning syndrome, it could be magnified by nalbufine hydrochlorate. NALBUFINE 10 is indicated to control pain produced by ocular traumas. In sport equines, is useful to control pain produced by colic, alone or in combination with Flunixin Meglumine. Also, it is helpful to control pain produced by Equine Degenerative Joint Disease and general osteoarticular pain. • As a morphinic antagonist: Complementarily, NALBUFINE 10 is indicated to partially revert to the effects of the pure morphinic agonists (morphine, fentanyl, etc.) keeping its analgesic action without naloxone (morphinic antagonist) collateral effects. Morphinic agonist effects reversion does not imply any renarcosis risk. Nalbufine is contraindicated in patients with hypersensitivity antecedents to the drug. In patients with cranial-encephalic and/or spinal trauma, because it could produce local vasoconstriction and aggravate the medical profile. In patients with acute respiratory depression. In patients with hepatic or severe renal malfunction. Several tests about fertility and reproduction capacity in rats reveal that Nalbufine does not influence on those functions. Teratogenicity tests in rats does not show any defect, nevertheless it is suggested its usage with precaution in pregnant females till there was more scientific information available. • Verify that the inviolability system and its storage conditions before its use are the suitable. • Suggested doses and warnings are to be considered by the veterinarian in charge. • Keep the product between 5 and 30 ºC, away from direct sunlight, in a dry and hygienic place. • The product should be administered alone in the same syringe; it should not be mixed with any other product. If an iatrogenic overdosage is faced, it is recommended: haemodialysis, peritoneal dialysis and the symptomatic treatment according to the criteria of the veterinarian in charge. Canines: Naloxone 0,04 mg/kg IM, IV, SQ. Felines: Naloxone 0,05 to 0,1 mg/kg IV. Sport equines: Naloxone 0,01 to 0,022 mg/kg IV.